his name on folio 3v as Leib Zahr Sofer (scribe) of L”B (Lackenbach, Hungary, now eastern Austria). Although it cannot be known with certainty where the scribe copied the manuscript, Nyitra is the likeliest option for two reasons. First, it is not likely that the scribe would have signed his name with his city of birth if he were still residing there. Second, the manuscript is reminiscent of the work of the most important Hungarian scribe of the early nineteenth century, Mordecai ben Josl, also known as Marcus Donath, who worked in Nyitra. 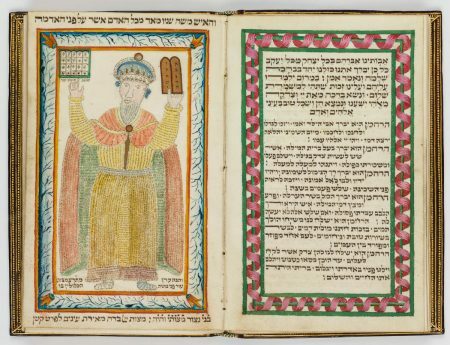 Donath is known to have produced around a dozen manuscripts, as well as an engraved megillah. Christie’s New York 2006, lot 542; Naményi 1941; Scheiber 1973/74; Scheiber 1979.